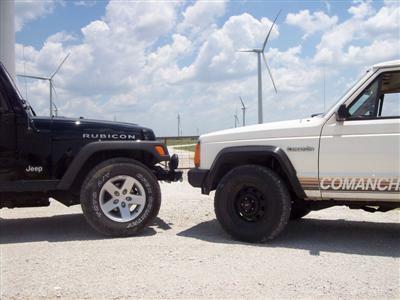 Jeep Wrangler Rubicon vs. Jeep Comanche! Seriously? Jeep Wrangler Rubicon vs. Old Jeep Comanche? 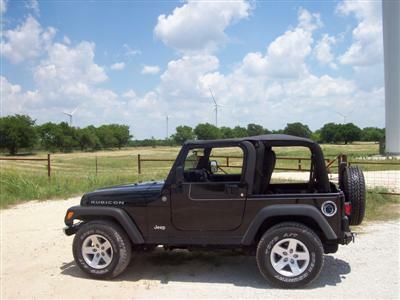 The Jeep Wrangler Rubicon in this story is a 2004 black beauty sporting the 4.0L straight 6-cylinder engine, automatic transmission, Dana 44 axles front and rear (both with locking differentials), soft, hard and Bimini tops and just a vision of what an off road vehicle should look like. 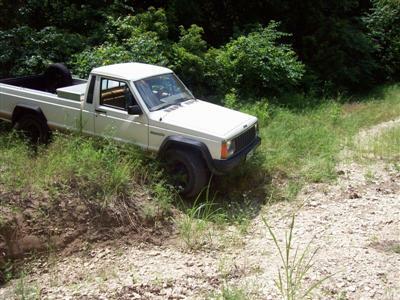 The challenger in this story is a bone stock 1987 Jeep Comanche MJ with the first production year of the now venerable 4.0L straight 6-cylinder engine with fuel injection, 5-speed manual transmission (BA-10), 2 speed NP-231 transfer-case, 4x4, all-terrain tires, long wheelbase, and a vision only a Comanche owner could love! Sounds like a David and Goliath, or Tortoise and the Hare type of story...right? 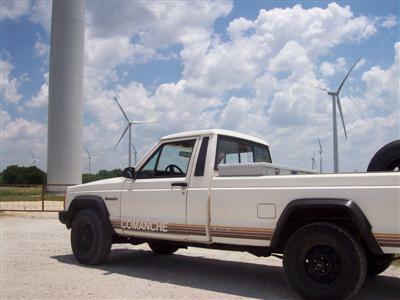 Although not officially discussed, the challenge was to see just how much the old Comanche could keep up with the Jeep Wrangler Rubicon "king of the hill" (so to speak). 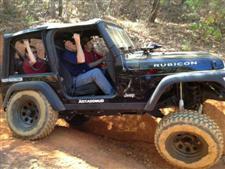 Andrew, the proud owner of the Rubicon Jeep is also my brother-in-law and a certified "Jeep Lover". He also has a really nice Jeep Commander gracing his garage as well. 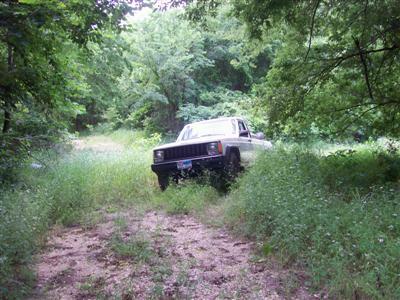 I am Larry, the proud owner of the Jeep Comanche, which has been carrying my behind from point A to point B and back for about 15 years now. 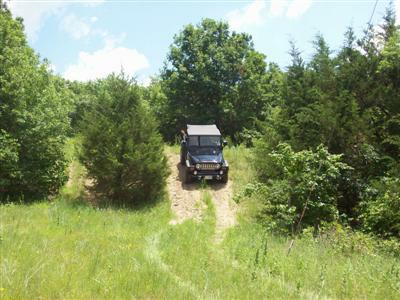 I am also the owner of this website, and have a good number of years in 4-wheeling several different brands of 4x4's as well as Jeeps. After owning other brands I found that nothing really compares to a Jeep. 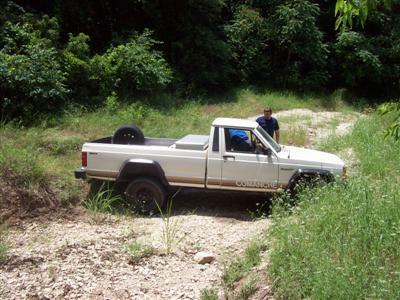 Prior to this excursion my '87 Comanche had really never been put to the test for one reason or another...so it was time to see what the old indian could do in a variety of off road situations. Andrew knew of some good trails between 50 to 75 miles from where we live. 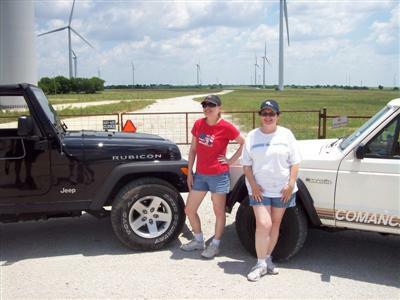 The first stop was St. Jo, Texas which is just north of Decatur, Texas near the Red River and the Oklahoma border. 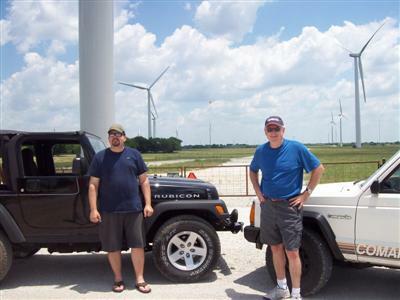 We took some hunting trails up to a high ridge where a giant windmill farm is located. These things are huge! The Rubicon led the way as I followed in my Comanche. We had each brought our lovely wives, and had walkie-talkies to communicate with each other on the trails because my MJ was not rigged with a CB. My MJ was able to handle some steep, rocky grades along with the TJ Ruby...until we came to a wash-out across a rarely traveled road. Andrew eased the black Wrangler into the wash as I spotted for him and he pulled out on the other side with no difficulty. When it was my turn I put it in low range and second gear, and began to descend into the gully. I had taken the same line as Andrew which turned out to be a mistake, and high-sided the rear overhang of the lengthy bed of my pickup. This caused my right rear tire to be nearly off the ground, while my left front tire buried into the soft sandy bottom. Not a good situation when your Jeep does not have locking differentials of any kind. So now I'm pretty well stuck at this point. No traction and the left front tire just wanted to dig in deeper. So now I had to somehow get some traction to the right rear tire. By strategically placing an angled rock under the leading portion of the right rear tire I was able to pull forward and gradually inch my way forward and back to get into position to exit the wash-out. Good spotting and experienced driving made this an exciting extraction, but if I had it to do over again I would have chosen a different line, such as approaching the ledge of the wash-out at an angle rather than straight on. After exploring a number of trails in the St. Jo area with no further problems we moved on to Lake Murray, which is just outside of Marietta, Oklahoma a few miles north of the Texas/Oklahoma border. These trails were quite different from those we had just left. There was a lot of soft sand and a number of watery mud pits along these trails. Andrew, with his wife and Jeep Wrangler Rubicon once again led the way while my wife and I followed in the Comanche Jeep pickup. Although the hills were not as steep as those around St Jo, the Lake Murray trails were soft, winding and quicksand-like mucky in many places. Here is where the seemingly invincible Jeep Wrangler Rubicon almost met its match. 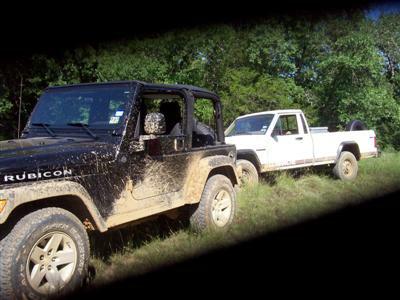 While both Jeeps managed to make it through quite a few mud pits, the last one was the granddaddy of mud pits and very deceiving. Andrew tried to power the Ruby through that pit in 4-wheel high like he had done with the others. 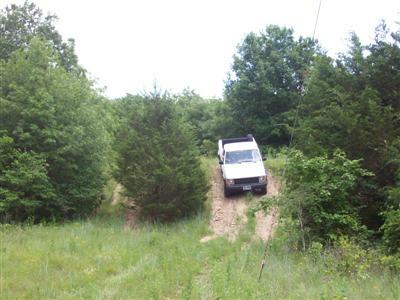 The only problem was that this "devil's pit" (my name for it) had a steep drop going in...and a steep, nearly vertical climb going out, and on top of all that it had deep ruts evidently from other larger tired trucks recently passing through. At this point we are watching from behind as Andrew again tried to power out of the pit, but his Jeep Wrangler Rubicon just started hopping up and down trying to climb out of it's bumper deep mud hole...with no success. I am now thinking that I should start getting the tow strap ready to pull him out...and even though it would have been really cool to have "rescued" a Jeep Wrangler Rubicon with my old Jeep Comanche, I didn't get the chance to try. Andrew proceeded to lock both axles, and with a little jab of the accelerator climbed right out of that evil captive pit to freedom again. It was so cool that I forgot to take any photos. Andrew had the video camera with him at the time, but I'm sure he had more important things on his mind than filming anything for Youtube...although it would have been pretty awesome. Oh, I almost forgot...I DID NOT even attempt to take the Comanche through that mud pit. What do they say? 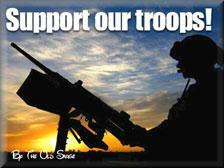 "Discretion is the Better Part of Valor." Not to mention that I would probably still be in that pit if I had attempted to cross it...ha! Afterward we were all hot and tired and ready to head for a bite to eat, and ended up stopping in Gainesville, Texas to relax and reflect. So, what did I learn about the differences between a 2004 Jeep Wrangler Rubicon and a 1987 Jeep Comanche MJ pickup? I learned a whole lot more than I expected. The Rubicon is a fabulous Jeep right from the factory...just as advertised. 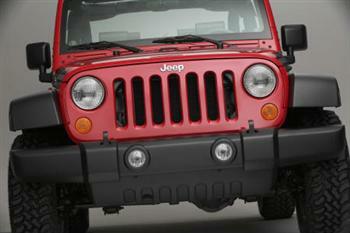 The extra amount you might pay to get a Jeep Wrangler Rubicon over a standard Wrangler in my opinion is worth it, in that if you were to build up a base Jeep Wrangler (on your own) to the same standards as the Rubicon, you would more than likely spend thousands more than the extra upfront cost of the Rubicon. I know I am biased, but I was so proud of the way the old girl performed. 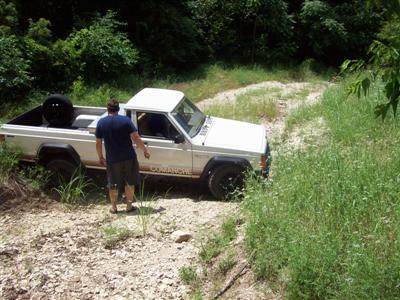 I also know that under more severe conditions the Jeep Wrangler Rubicon would run rings around the Comanche, but for everyday exploring and mild to moderate off roading, the Comanche was up for that challenge...and then some. So...did David slay Goliath, or the tortoise beat the hare in this story? Well, not exactly if you read this account carefully. David (my Comanche) could not quite beat up on Goliath (Andrew's Rubicon)...however, the Comanche MJ stood her ground and apparently won the respect of all involved...especially me. Finally, if there is a moral to this story I would have to say...simply enjoy what you have...Jeep Wrangler Rubicon or not...drive it with skill, have respect for its limitations...and you should have loads of fun!